Every January I seem to set myself these unrealistic resolutions, like in 2012 when I kidded myself i was going to give up bread, which last all of about two and a half weeks. It's usually about this time in the month when i've near on thrown in the towel but for the first time, in for ages, i'm actually still going strong! So what did i promise myself this year - this year, i vow to drink more water. As we're all constantly told, keeping hydrated is important and drinking water is an essential part of leading a healthy, balanced life. It helps keep your skin clear, improves concetration, flushes out toxins and helps to stop your body from retaining too much water which causes bloating. I actually quite enjoy drinking water, but glugging away pint after pint at work can get a bit repetitive so finding a way of making water more interesting, whilst not loading it with calories is important. 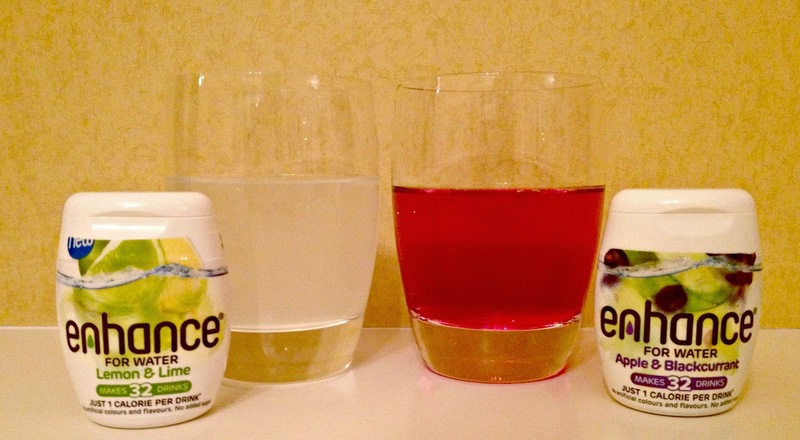 To keep me on the straight and narrow of drinking enough water each day, I've tried out Enhance, a new pocket sized water enhancer which allows you to add a natrual fruity flavour to water so you can enjoy all the taste without adding calories. What I love most about it is that its a really handy size, you get around 32 drinks from a bottle, and it's small enough that you can keep in your handbag so you can use it on the move. Made from real fruit juice, with no artificial colours or flavours or added sugar, it’s the perfect way to get your daily recommendation. On top of this, for every bottle sold enhance will make a donation to the charity Just a Drop, which will provide a child in Africa with clean and safe drinking water for a month. Each squeeze only has one calorie so it's completely guilt free but still tastes more interesting than plain old water. The range includes four delicious fruit flavours - Orange and Passion Fruit, Lemon and Lime, Strawberry and Kiwi, Apple and Blackcurrant. My personal favourite was Orange and Passion Fruit – I adore anything passion fruit flavoured so I knew I’d be onto a winner with this one. The Lemon and Lime was a close second – it reminded me of Robinson’s Lemon Barley squash, but without the horrible claggy after-taste. Overall I was really impressed with the range and have one sitting on my desk, one in my handbag and one in my gym-bag so it’s easy for me to use it on the go. I think these will be excellent to take on holiday and as they are only 53ml, you’ll have no problems transporting them on the plane – I’ll be slipping one in my beach bag now! 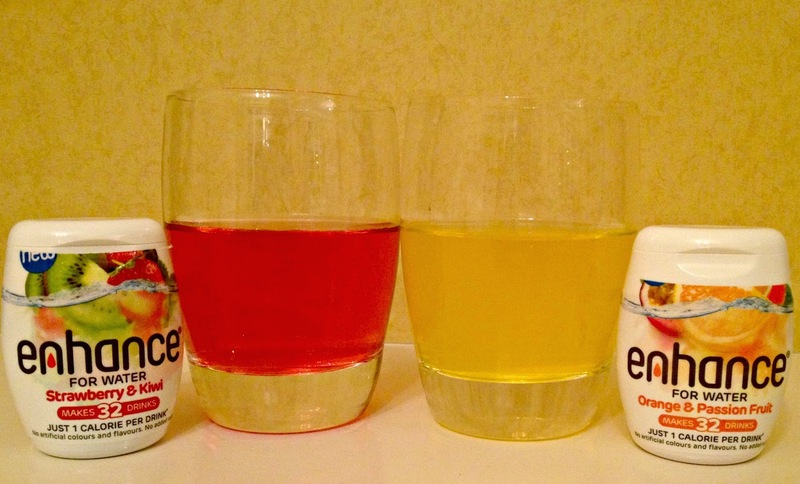 The enhance range is available from ASDA, Ocado and from www.enhancedrinks.co.uk and will be on special offer at £2 in selected ASDA stores until 12thFebruary.